Mr. Suparut Kawatkul, Permanent Secretary of Ministry of Finance and acting the Chairman of the Board of Directors, Krung Thai Bank (KTB), and Mr. Suri Buakhom, the Independent Director of KTB, jointly visited Baan Samka Community Bank-KTB and gave sport equipment to the director of Baan Samka School, Mae Ta District, Lampang. Mr. Kawatkul also open the meeting with Baan Samka community leader, the manager of Lampang District office and the branch manager under KTB and visited KTB?? 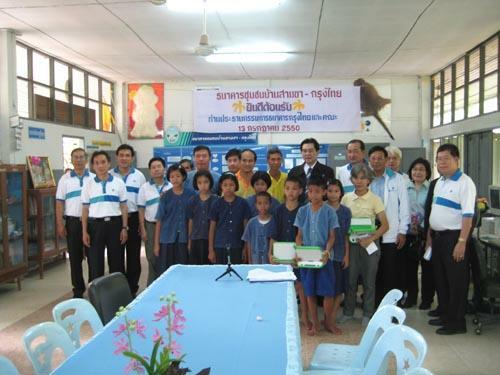 ?s Mae Moh branch at Lampang province later on, July 13 2007.